Salford College offers English for Academic Purposes Courses (EAP). These programs are designed for students from non-English speaking backgrounds, with Literacy, Language and numeracy issues, who want to learn English for better cultural assimilation or who wish to pursue further academic studies. At Salford College, students study in small classes, interact with a variety of people, develop a close rapport with others and have fun. In addition to class room studies, there are indoor and outdoor activities which help students adapt to the local environment. ELICOS programs have been designed for students who come from overseas to study English for a variety of reasons, including the need to develop their English-language skills in order to undertake further studies in Australia. In most countries there is no control over ESL teaching. In Australia the government regulates the English teaching industry to make sure that all international students receive a high quality of instruction. The key feature of the English Language Intensive Courses for Overseas Students (ELICOS) sector of Australian education has been the establishment and ongoing maintenance of an appropriate regulatory framework to protect the sector. 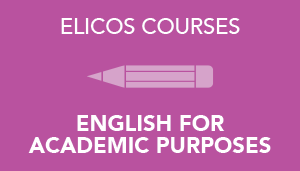 The ELICOS framework relates to international students who will be studying English in Australia as part of an intensive English language program. In this case, ‘intensive’ means a minimum of 20 hours of scheduled classes involving face-to-face contact hours of English language instruction. ELICOS standards are protected through legislative instruments which ensure certain requirements are met before English language providers are registered and that they maintain these requirements throughout the course of their registration. This approach provides confidence for all stakeholders involved in the provision of English language instruction.